Once you have implemented the elimination phase of the low FODMAP diet and had good results, meaning that your symptoms have settled, it is time to start thinking about reintroduction. This can be a bit of a scary thought, especially if you’ve had dramatic improvements with elimination. 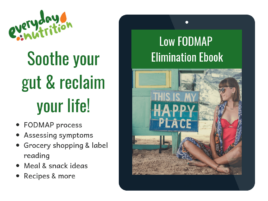 But completing this phase of the Low FODMAP diet will allow increased freedom in your food repertoire, while giving you the skills to manage your individual symptoms. It’s also good to know that if you have had good results with elimination, you now have a “baseline” diet that you can return to at any time if symptoms become too much. You can read more about if you’re ready to reintroduce from Alana at A Little Bit Yummy here. You may be surprised to know that reintroduction is about more than just identifying foods you can and can’t eat. It actually teaches you many skills that will be useful in your long term FODMAP journey. So before we get started, let’s have a look at what there is to gain out of the reintroduction process. 1. Learn how and why different foods are considered FODMAPs. Different FODMAP groups trigger symptoms for different reasons. This is why you may be sensitive to some of the FODMAP groups but not others. As you work through each of the challenges, it’s a good idea to become familiar with what goes on inside your body, and how each group of FODMAPs triggers symptoms. This knowledge will help you make much more sense of the diet and make it seem a lot less random. 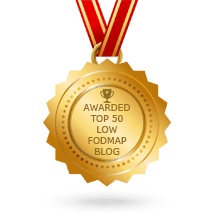 It is also worth considering that the low FODMAP diet is a relatively new technique, and we are continually learning more and more about which foods fit where. Having a good understanding of how FODMAPs work inside the body, means that over time as recommendations change and knowledge increases, you will easily be able to grow and adapt your eating plan while still managing your symptoms. 2. Identify which FODMAP groups you are sensitive too. Reintroduction is about testing the FODMAP groups rather than specific foods. You want to arm yourself with the knowledge of how much of which groups of FODMAPs you can tolerate, as well as which ones are really a ‘no go’. Most foods, however, contain combinations of FODMAPs and most meals will also contain combinations of foods. Once you have a good baseline knowledge of your individual sensitivities, you will be able to personalise and make informed decisions about which foods or food combinations are likely to end in disaster, and which ones are worth trialling. 3. Identify mild, moderate or severe symptoms and what you are willing to tolerate. 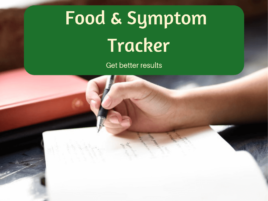 As you experiment with different FODMAP groups and doses, you will probably experience a range of symptom severities. I encourage people to rate these symptoms on a scale of 0-10, with 0 being no symptoms and 10 being severe symptoms. There is a large difference between symptoms that are 2/10 and symptoms that are 8/10, so doing this will help you identify what level you are willing to tolerate and where symptoms begin to interfere with your quality of life. The low FODMAP diet is not a cure for IBS, the goal is to minimise symptoms enough to improve quality of life, not prevent them all together. Many high FODMAP foods are also pre-biotics which along with instigating bloating, also contribute to keeping the gut healthy by nourishing the healthy bacteria that live there. This means a little bit of bloating, say 2/10, is actually healthy and a good thing. 4. Learn how to trial foods. Reintroduction is really just the beginning, and being able to design your own challenges and ensure you get an accurate result is one of the most important skills you will develop. It will give you the freedom to expand your food repertoire to more than just the foods that have been tested at this point in time. 5. Learn which foods fit into which groups. 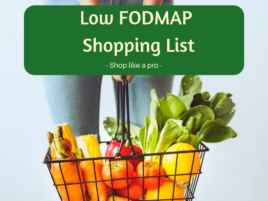 Although the low FODMAP diet is not a forever diet, having a working knowledge of foods that you eat regularly without having to look them up, does make things a bit easier and less scary on a day to day basis. As you work through each group of FODMAPs have a look at what foods contain them and get to know where they fit into the FODMAP picture. This will improve your confidence and make the day to day balancing act more enjoyable and less of a chore.